Voters in the November election will be acutely aware of two key economic variables above all others: the national unemployment rate, and the price they pay for a gallon of gasoline. President Obama senses his vulnerability on gasoline prices, and is busy erecting a defense against charges that his actions (or inactions) have contributed to high prices. Ending this cycle of rising gas prices won’t be easy, and it won’t happen overnight. But that’s why you sent us to Washington – to solve tough problems like this one. So I’m going to keep doing everything I can to help you save money on gas, both right now and in the future. Earlier this week, Obama said that gasoline prices are rising in part because of international bottlenecks and supply disruptions that affect the crude oil market. In its Mar. 6 Short-Term Energy Outlook (STEO), the US Energy Information Administration said several notable production disruptions outside the Organization of Petroleum Exporting Countries began or intensified during the last 2 months, leaving an average 1 million b/d [barrels per day] offline in February. Those production disruptions include a year-on-year loss of 230,000 b/d in the Sudan, 80,000 b/d in Yemen, and 140,000 b/d in Syria. That’s 470,000 b/d total shortfall from just those three hotspots. I agree with this analysis, which acknowledges the supply/demand dynamics of the crude oil market. I have often maintained that crude oil is a world market that is balanced on a thin margin of “overhang”: global markets operate best if production capability exceeds demand by 1 to 2 million barrels per day. Anything that erodes that overhang (supply disruptions, increasing demand) can send crude oil rapidly higher. Bottom line: gasoline prices are closely correlated to the crude oil price, and crude oil disruptions in half-million barrel per day “chunks” are significant to the crude oil price on a global scale. President Obama’s Sudan/Yemen/Syria excuse acknowledges as much. As usual, politicians have been rolling out their three-point plans for two-dollar gas: drill, drill, and drill some more. Well, my response is, we have been drilling. Under my Administration, oil production in America is at an eight-year high. We’ve quadrupled the number of operating oil rigs, and opened up millions of acres for drilling. But you and I both know that with only 2% of the world’s oil reserves, we can’t just drill our way to lower gas prices – not when consume 20 percent of the world’s oil. “We’ve” been successful finding new sources of oil on private lands, under state jurisdiction (primarily North Dakota, Texas and Oklahoma), driven by market incentives. Federal action deserves little or none of the credit. But oddly, Obama’s position is “Drilling is up, production is up, but gas prices are still high!”, implicitly contradicting the supply/demand dynamic. One can only imagine how high gasoline prices would be without the recent supply surge. There’s a reason President Obama must discount the positive effect of increased domestic supply: his policies have been hostile to it as a strategy. 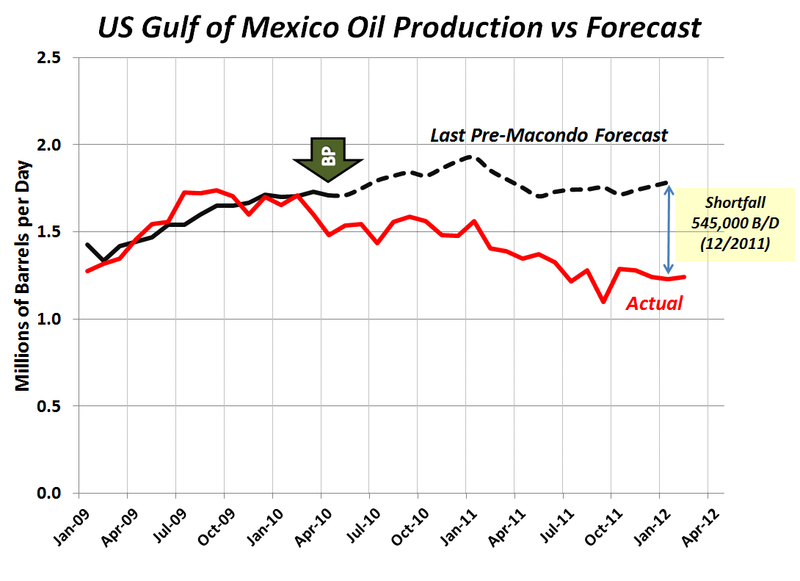 The graph below depicts crude oil production from the U.S. Gulf of Mexico during President Obama’s term in office. Daily production of oil has dropped from a third of domestic supply to less than a quarter since the BP spill. Gulf of Mexico crude oil production during President Obama's term in office. The dashed black curve is the forecast from the EIA's Short Term Energy Outlook for May 2010; actual data from the most recent STEO is in red. The May 2010 STEO was the last projection that did not take into account the impact of the BP spill. As for 2012, the EIA’s Annual Energy Outlook for 2010 (AEO2010), published in December 2009, forecast GoM crude oil production to average 1.76 million b/d. The latest estimate is 1.26 million b/d. (For those keeping score, that’s a loss of 500,000 b/d, using the government’s numbers, not mine.) The Department of the Interior’s reaction to the Macondo blowout was a drilling moratorium and permitting slowdown which led to the exodus of 11 deepwater drilling rigs from the Gulf. In my humble opinion, the Federal reaction to the BP spill was mostly overreaction. The most significant step in insuring industry’s capability to contain and control a future deepwater blowout event was a private initiative. As for bottlenecks, none is perhaps more significant than the bottleneck that is currently keeping midcontinent oil, pegged to the West Texas Intermediate crude oil benchmark, trading at a discount to the world price. That bottleneck could be alleviated by the Keystone XL pipeline, among other projects. Keystone XL could deliver 700,000 b/d to Gulf Coast (and hence, international) markets. With respect to domestic supply, Keystone XL is especially important to North Dakota operators. An improved oil marketing outlook for the region could spur an even greater pace of drilling in North Dakota’s Bakken formation, which is largely responsible for the current domestic supply surge. An enhanced domestic supply of petroleum, along with efficient, modern infrastructure, are key elements of our nation’s energy security. The President is correct in his assertion that tight crude oil supplies lead to escalating gasoline prices. But domestically, his policy initiatives seem designed to discourage drilling and to erect stumbling blocks for producers. I’m going to keep doing everything I can to help you save money on gas, both right now and in the future. I just don’t buy it. His lips keep moving, but there’s a big disconnect between President Obama’s campaign rhetoric and his policies. True that it is a global market, but with regional differences and inequalities and price at point of delivery PLUS transportation to refinery cost does not seem to be included. Then there is the efficiency and complexity of each refinery and ability to utilized below market quality and price of certain crude oils. Keystone XL is to deliver 700,000 bpd of Canadian Syncrude to its terminus at Nederland, TX (which ain’t Houston folks.) This is NOT equivalent to Bakken, Eagle Ford, or Gulf of Mexico sweet light crude oils. While it has been sweetened during the upgrading process, it is still quite heavy crude with an API gravity of 20, as opposed to the others which is 40 API, more or less. There are a dozen refineries, more or less, which back in the 1980’s configured themselves to process cheaper than prevailing market Venezuelan crude blends, as well as PEMEX Mayan blend. These are quite heavy crude oils. Mayan has been in decline for several years now, as has Venezuelan (since the general strike by professionals in 2002/2003). Canadian Syncrude really is necessary to replace other heavy crude on the increasingly unstable Venezuelan source. It is also less expensive at point of origin by more than a few dollars. If I am not mistaken, Canadian Syncrude is sold at $68 per barrel at point of origin. Venezuelan is generally priced equivalent to the Brent benchmark less $5 to $10 per barrel, but the freight to the Gulf Coast from Venezuela is less than half the cost of freight from the North Sea. Considering that several ships are dedicated to the Venezuela/US Gulf Coast trade on time charter that cost is even less. Where else is Venezuela going to find refineries able to convert its crude as efficiently, with a cheap freight rate IN THE WORLD? Blocking Keystone XL is a geopolitical favor for Hugo Chavez and puts several of our TX and LA refineries on shaky ground. BTW, I’d pay close attention to ConocoPhillips refining profit margins. Via Keystone (already built) they are getting Canadian Syncrude to their refineries in Wood River, IL & Borger, TX at a lower cost than other crude oil sources. They had to spend the $ Billions a few years ago to take this source of crude, but it sure seems like a great strategy. Scott over at thehayride has my phone and email contact info. Give me a call or email. I’d like to talk more than I can here. When he says “I’m going to keep doing everything I can to help you save money on gas, both right now and in the future.” he’s telling the truth, but you have to look at it from his perspective, i.e. you will say money on gas because you will not be able to afford any. Remember his “…prices will necessarily skyrocket” speech? He is staying true to his word.